Dr. Mint (an acronym formed from the first letter of each member's last name) is a fledgling quintet of young West Coast improvisers. Executing a pair of spontaneously composed long-form suites with the assurance of seasoned veterans, these twenty-somethings conjure a testosterone fueled fever dream on Visions and Nightmares. Caterwauling horns, scorching metallic guitar and a thrashing prog-metal rhythm section alternates bone-crushing intensity with introspective passages and dark cinematic ambiance. "Apocalyptica" and the titular suite were both recorded live in the studio, in a single unedited take. An endlessly fluctuating web of throbbing bass ostinatos, churning guitar riffs and pneumatic vamps serve as the foundation for free-wheeling excursions. Brief interludes offer shadowy atmospherics that eschew traditional strategies, unfolding with fluid, rubato pacing. With unswerving focus and expansive vision, the quintet demonstrates keen interplay and adroit improvisational skills. The unofficial leader, trumpeter Daniel Rosenbloom recently released his debut album, the highly regarded Bloodier, Mean Son (Nine Winds, 2006). Drummer Caleb Dolister studied at the University of Nevada, boasting a lengthy list of sideman gigs. Saxophonist Gavin Templeton, guitarist Alex Noice and bassist Sam Minaie are all 2008 CalArts graduates. Revealing impressive listening skills and an affable rapport, the quintet navigates abrupt shifts in tempo, timing and dynamics. Alex Noice's howling acidic guitar spurs the rhythm section into a bracing clip on "Fire Flight." Kicking into overdrive, they unleash a blitzkrieg of astonishing aural violence before seamlessly downshifting into a bruising cadence. Providing supportive accompaniment to each other on "Chasing Dreams," the clarion horns of Daniel Rosenbloom and Gavin Templeton spar with vigorous intensity on "Duel in The Deep." With vivacious brio, Templeton's circuitous alto on "Fire Flight" mirrors Rosenbloom's fractious trumpet on "Dance For The Fire Reign." Sam Minaie and Caleb Dolister augment primal rock rhythms with jazzy elan and a nuanced touch. Demonstrating dynamic versatility, they wax nostalgic on "Waiting...," while Minaie offers a supple, melodic bass solo on "Soma," with Dolister providing sensitive accompaniment. 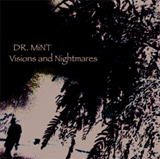 Dr. Mint present a thoroughly modern view of jazz informed, but not limited by, a dark and sometimes menacing future. Visions and Nightmares is an impressive debut recording, regardless of style or genre. Track Listing: Visions and Nightmares Suite: First Light; Gathering; Fire Flight; Submerge; Duel In The Deep; Breach; Waiting...; Apocalyptica Suite: Prophecy; Soma; Chasing Dreams; Rift; Dance For The Fire Reign; The Horsemen Ride; Wasteland; Summon The Shadow Sun. Personnel: Daniel Rosenbloom: trumpet and piccolo trumpet; Gavin Templeton: alto saxophone; Alex Noice: electric guitar and vox sampling; Sam Minaie: electric bass and effect loops; Caleb Dolister: drums.